Unakite Jasper brings together the abundant, nurturing energy of green with the soft, caring passion of an orange/pink in one of Nature's most healing semiprecious metamorphic stones of the heart and mind. It resonates with the frequency of love, compassion and kindness, and is a stone dedicated to balancing the emotional body. A slightly curved discus shaped single piece of highly polished Unakite will be in contact with your heart chakra when worn beside the skin. The backside of this pendant is simply just the beautiful stone it self. Flower of Life belongs to Sacred Geometry which believes that all life is part of a divine, geometric plan. It is a geometrical shape consisting of overlapping circles, which are spaced out in six-fold symmetry to give it the look of a flower, reflecting perfection and harmony. 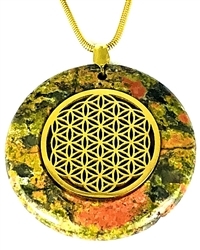 This Gold Plated, Flower of Life Circular Pendant, is 2 inches in diameter and comes with a 24 inch 2mm thick gold plated stainless steel smooth snake chain. All Unakite pendants will vary slightly in color and pattern. Each pendant will be unique as it is not a homogeneous gemstone. Please note how the 30 MM convex dome glass lens amplifies the laser cut gold grid pattern in the center of this unique pendant. This ancient symbol is believed to be well over 6,000 years old. It has been found on temple walls, in manuscripts, and at sacred sites across Europe, the Middle East, China, India and Japan. Leonardo da Vinci did many sketches and studies of the Flower of Life as well as the Seed of Life. Some believe the Flower of Life has a deep connection with the creation and fabric of life. The innermost 7 circles of the Flower of Life are also known as the Seed of Life or Genesis Pattern. The center circle represents the unmanifested absolute spirit. From there spirit or cosmic intelligence makes a second circle, then a third and so on until there are a total of six circles surrounding the first. Scientifically, the Flower of Life is an expression of electromagnetic energy. It can manifest within many different waveforms or frequencies as interconnected, emanating circle patterns which can be observed in sound, matter, or electricity. This sacred harmonic resonant pattern is recognized as uplifting the vibrations of those around it, which may explain why it can be found in so many sacred sites worldwide. Those who study and meditate on the Flower of Life find that it inspires the consciousness through its deep spiritual meanings. The beginning study of sacred geometry can start with as little as a compass and ruler. Many fascinating, sacred geometrical patterns are considered to be derived from the Flower of Life such as: the Seed of Life, the Fruit of Life, the Egg of Life, Metatron’s Cube, and the Kabbalah or Tree of Life. The flower of life represents the connectivity of all life. Everything in the universe is connected. Modern physics calls this “Quantum Entanglement.” Each one of us is deeply connected with one another and all things in this world. The universal spirit omnisciently pervades everything with oneness of consciousness and spiritual unity. In order to advance spiritually we need to help and strengthen those less fortunate than us. In fact, when we do so we are really only helping ourselves. This help can be spiritual, mental, or physical in nature. When we forget ourselves and give our help to others, we are expressing selfless love and compassion and in doing so we feel more connected to our inner being. Those ideals of selfless love, compassion, and connectedness are symbolized in the interconnecting radiant pattern of the Flower of Life. Thousands of individuals who have clinically died and come back to physical life attest to having a past life review and seeing the ripple effect of how their behavior affected those around them. It has deeply inspired them to become more spiritual and helpful to society. Such a sacred ripple effect is reflected in the Flower of Life.